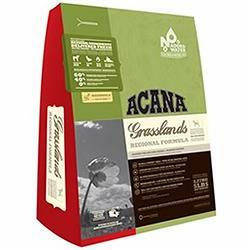 There's a whole range of foods for both cats and dogs in the Acana range, a Canadian brand, from pup and kitten all the way through to seniors. Be aware through that this is probably a different kind of food than you have been feeding, and may take some adjusting to. It tries to mimic the diet of a dog's wolf-like ancestors. It's also very expensive at around £60+ for 13kg. 1. A large selection of fresh meat: based on the natural dietary requirements of dogs with a broad range of different animal proteins: poultry, wild-caught fish and natural ranch lamb. 2. Rich in meat and proteins: for great health and well-being. Tailored to a short intestinal tract and metabolising animal proteins and fats. 3. Low carbohydrate content and no grains: dogs are predominantly carnivores. Carbohydrates increase blood sugar levels and convert into glucose, which leads to obesity and diabetes. 4. Fresh fruit and vegetables: whole, freshly picked fruits and vegetables from the local region that are rich in natural vitamins and minerals. 5. Invigorating herbs and plants: plant roots, grasses and flowers that aid the metabolism, the organs and nervous system, as well as filtering out toxins by boosting the liver's natural cleaning process. 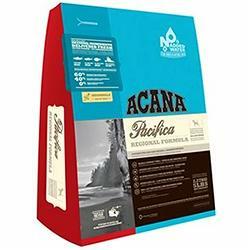 There's no dout that Acana contains some good quality ingredients, but opinion is still divided on the efficacy of feeding a diet that tries to be more wolf-like in its composition with a very high % of animal protein. It may not suit all pets, and this is a very expensive food compared to many other 'natural' recipes which can be up to half the price of Acana. Fresh salmon (13%), dried salmon (12%), dried herring (10%), dried whitefish (10%), whole peas, red lentils, fresh potatoes, fresh herring (5%), fresh flounder (4%), herring oil (4%), field beans, canola oil, sun-ripened alfalfa, pea fibre, natural fish flavour (2%), fresh apples, fresh pears, fresh sweet potatoes, fresh pumpkin, fresh butternut squash, fresh parsnips, fresh carrots, fresh spinach, cranberries, blueberries, seaweed, chicory root, juniper berries, angelica root, marigold flowers, sweet fennel, peppermint leaves, lavender, rosemary, Enterococcus faecium. Additives: Vitamin A (15,000 IU/kg), vitamin D3 (2000 IU/kg), iron (40 mg/kg), iodine (3 mg/kg), copper (13 mg/kg), manganese (14 mg/kg), zinc (150 mg/kg), selenium (0.3 mg/kg). Preservatives: vitamin E (α-tocopherols). Fresh lamb meat (11%), dried lamb meat (10%), dried duck meat (10%), dried whitefish (10%), whole peas, red lentils, broad beans, fresh potatoes, fresh duck meat (3%), fresh whole eggs (3%), fresh walleye (3%), duck fat (3%), herring oil (3%), alfalfa, fresh lamb liver (2%), salmon meal (2%), pea fibre, fresh apples, fresh pears, fresh sweet potatoes, fresh pumpkin, fresh "butternut" pumpkin, fresh parsnips, fresh carrots, fresh spinach, cranberries, blueberries, seaweed, chicory root, juniper berries, angelica root, marigold flowers, sweet fennel, peppermint leaves, lavender, rosemary, Enterococcus faecium. Additives: Vitamin A (15,000 IU/kg), vitamin D3 (2,000 IU/kg), iron (40 mg/kg), iodine (3 mg/kg), copper (13 mg/kg), manganese (14 mg/kg), zinc (150 mg/kg), selenium (0.3 mg/kg). Preservatives: vitamin E (α-tocopherols).